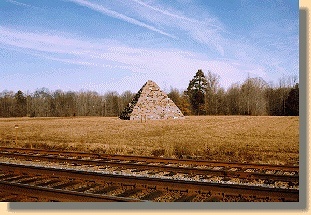 sought to memorialize the battle in a location visible to train travelers. 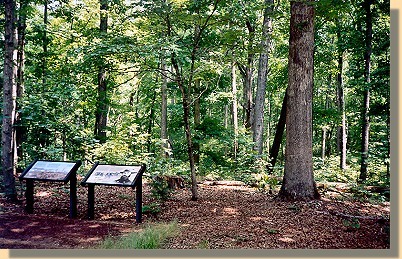 In the photo of Jackson's front" (right, above), Hamilton's Crossing is located on the far right beyond the trees. Marker and Sign marking the location of Major John Pelham's artillery action at Hamilton's Crossing. (Click on the sign to read its text). When 120,000 Federal troops began advancing across the plain in Jackson's front they began receiving artillery fire into the left of their line. It was from Major John Pelham, commander of J.E.B. Stuart's horse artillery . Pelham had taken a single twelve-pounder Napoleon cannon to a crossroads near Hamilton's Crossing, about a half-mile in front of Jackson's position at an angle to the Federal line. From there, he opened fire and repeatedly sent shots into the enemy ranks. Shortly thereafter a Confederate Blakely rifled cannon joined Pelham in the assault wreaking havoc on the Union's left flank . 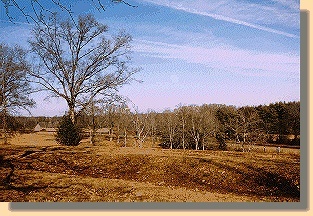 Union General Franklin's 120,000 man assault halted. Return fire from Federal artillery took out the Blakely but that did not phase Pelham. He kept relocating and firing his Napoleon so fast that five Union batteries began responding to what they thought was a full Confederate battery on the left end of their line. Stuart ordered Pelham, three times, to withdraw, but he did not comply until he was out of ammunition. He then casually limbered his gun and returned to Hamilton's Crossing. Lee, watching Pelham stop the Union assault single-handedly, said "It is glorious to see courage in one so young".